Allergic rhinitis is a common problem in Islamabad and Rawalpindi. It occurs when your immune system reacts to particles (allergens) in the air that you breathe by causing an allergic reaction such as sneezing, inflammation and a runny nose. There are two types of allergic rhinitis: seasonal and perennial. Perennial allergic rhinitis, which can occur all year round, is usually triggered by indoor allergens such as pet dander, dust mites, dust, mold and occasionally food allergy. 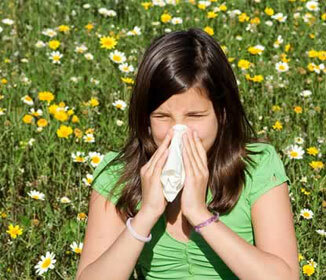 Seasonal allergic rhinitis is seasonal and is caused by outdoor allergens such as pollen from trees and plants. It is also likely that there is a genetic factor involved. If your parents have allergies, you are also likely to have allergies. The chance is higher if your mother has allergies. You may have symptoms only at certain times of the year if you are allergic to pollen. If you are allergic to indoor allergens or dust mites, you may have symptoms all the time. People with allergies usually have symptoms for many years. Some conditions such as asthma and ezcema can also be associated with allergic rhinitis. 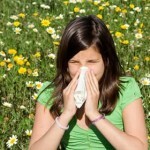 There may also be other problems such as sinusitis and ear infections as a result of your allergies. Do not use carpets in the house. Replace carpets with hard flooring. Use synthetic pillows instead of those with feather fill. Enclose mattress and pillows in allergen-impermeable covers. Wash pillow and bed sheet covers and blankets in hot water (55-60 degree Celsius). Diagnosis by your doctor is based on physical examination and symptoms. Skin testing, as in a skin patch or prick test, is a common way of testing for the particular allergen that is causing your reaction. Blood tests to detect certain antibodies in the blood can confirm a diagnosis of allergy. Rhinoscopy. A rhinoscope is used to look inside the sinuses, upper passages and upper airways to look for nasal polyps or other problems that may be blocking the nasal cavity. Imaging tests. X-rays, CT scans and MRIs can be used to look for sinus infection and chronic inflammation or thickening of the sinus lining (as a result of chronic inflammation), structural defects and cancer. The best treatment is to avoid the source of allergy. However, if that is not possible or does not work, other treatment options are available. Treatment is individualised depending on the type and severity of symptoms and other underlying medical conditions. Antihistamines. Antihistamines provide relief by controlling symptoms of allergy. It does so by neutralising the effect of the histamines released into the bloodstream during an allergic reaction. Corticosteriods. Cortisone nasal sprays are very effective in reducing the inflammation which causes swelling,sneezing, and a runny nose. Cortisone helps the body counter the effects caused by an allergic reaction. Decongestants. Decongestants either taken orally or in the form of nasal sprays can help control allergy symptoms but not their causes. By shrinking the swollen membranes in the nose, decongestants make it easier to breathe. But this form of treatment can only be used for short periods. Allergy Shots. For some people with very bad symptoms, immunotherapy or allergy shots may be helpful. Immunotherapy helps your body handle the allergens by exposing it to increasingly higher doses of the allergen. Your doctor will advise on the best course of treatment for you. Pollen Allergy. Nasal Allergy. Interview on FM-93 – Radio Pakistan.